French military disasters in 1798 and 1799 had shaken the Directory, and eventually shattered it in November 1799. Historians sometimes date the start of the political downfall of the Directory to the 18 June 1799 (Coup of 30 Prairial VII by the French Republican calendar), when the now only one month in office serving anti-Jacobin Director Emmanuel-Joseph Sieyès, with the help of the Directory's only surviving original member, the anti-Jacobin Paul Barras, successfully rid himself of the other three then-sitting directors. The March-April 1799 elections to the two councils had produced a new Neo-Jacobin majority in the two bodies, and being unhappy with the existing five man Directory, by 5 June 1799, these councils had found an irregularity in the election of the Director Jean Baptiste Treilhard, who thus retired in favor of Louis Jérôme Gohier, a Jacobin more 'in tune' with the feelings in the two councils. The very next day, 18 June 1799, the anti-Jacobins Philippe-Antoine Merlin (Merlin de Douai) and Louis-Marie de La Revellière-Lépeaux were also driven to resign, although one long time anti-Jacobin, popularly known for his cunning, survived the day's coup; they were replaced by the Jacobin Baron Jean-François-Auguste Moulin and by the non-Jacobin, or 'weak' Jacobin, Roger Ducos. The three new directors were generally seen by the anti-Jacobin elite of France as non-entities, a 'put-down' if ever there was one, but that same elite could take some comfort in knowing that the five man Directory was still in anti-Jacobin hands, but with a reduced majority. A few more military disasters, royalist insurrections in the south, Chouan disturbances in a dozen departments of the western part of France (mainly in Brittany, Maine and eventually Normandy), Orléanist intrigues, and the end became certain. In order to soothe the populace and protect the frontier, more than the French Revolution's usual terrorist measures (such as the law of hostages) was necessary. The new Directory government, led by the anti-Jacobin Sieyès, decided that the necessary revision of the constitution would require "a head" (his own) and "a sword" (a general to back him). Jean Victor Moreau being unattainable as his sword, Sieyès favoured Barthélemy Catherine Joubert; but, when Joubert was killed at the Battle of Novi (15 August 1799), he turned to General Napoleon Bonaparte. Although Guillaume Marie Anne Brune and André Masséna won the Battles of Bergen and of Zürich, and although the Allies of the Second Coalition lingered on the frontier as they had done after the Battle of Valmy, still the fortunes of the Directory were not restored. Success was reserved for Bonaparte, suddenly landing at Fréjus with the prestige of his victories in the East, and now, after Hoche's death (1797), appearing as sole master of the armies. In the coup of 18 Brumaire Year VIII (9 November 1799), Napoleon seized French parliamentary and military power in a two-fold coup d'état, forcing the sitting directors of the government to resign. On the night of the 19 Brumaire (10 November 1799) a remnant of the Council of Ancients abolished the Constitution of the Year III, ordained the Consulate, and legalised the coup d'état in favour of Bonaparte with the Constitution of the Year VIII. The initial 18 Brumaire coup seemed to be a victory for Sieyès, rather than for Bonaparte. Sieyès was a proponent of a new system of government for the Republic, and the coup initially seemed certain to bring his system into force. Bonaparte's cleverness lay in counterposing Pierre Claude François Daunou's plan to that of Sieyès, and in retaining only those portions of each which could serve his ambition. The new government was composed of three parliamentary assemblies: the Council of State which drafted bills, the Tribunate which could not vote on the bills but instead debated them, and the Legislative Assembly, whose members could not discuss the bills but voted on them after reviewing the Tribunate's debate record. The Sénat conservateur was a governmental body equal to the three aforementioned legislative assemblies and verified the draft bills and directly advised the First Consul on the implications of such bills. Ultimate executive authority was vested in three consuls, who were elected for ten years. Popular suffrage was retained, though mutilated by the lists of notables (on which the members of the Assemblies were to be chosen by the Senate). The four aforementioned governmental organs were retained under the Constitution of the Year XII, which recognized Napoleon as the French sovereign Emperor, but their respective powers were greatly diminished. Napoleon vetoed Sieyès' original idea of having a single Grand Elector as supreme executive and Head of State. Sieyès had intended to reserve this important position for himself, and by denying him the job Napoleon helped reinforce the authority of the consuls, an office which he would assume. Nor was Napoleon content simply to be part of an equal triumvirate. As the years would progress he would move to consolidate his own power as First Consul, and leave the two other consuls, Jean Jacques Régis de Cambacérès and Charles-François Lebrun, as well as the Assemblies, weak and subservient. While this near-unanimity is certainly open to question, Napoleon was genuinely popular among many voters, and after a period of strife, many in France were reassured by his dazzling but unsuccessful offers of peace to the victorious Second Coalition, his rapid disarmament of La Vendée, and his talk of stability of government, order, justice and moderation. He gave everyone a feeling that France was governed once more by a real statesman, and that a competent government was finally in charge. Bonaparte had now to rid himself of Sieyès and of those republicans who had no desire to hand over the republic to one man, particularly of Moreau and Masséna, his military rivals. The victory of Marengo (14 June 1800) momentarily in the balance, but secured by Desaix and Kellermann, offered a further opportunity to his ambition by increasing his popularity. The royalist plot of the Rue Saint-Nicaise on 24 December 1800 allowed him to make a clean sweep of the democratic republicans, who despite their innocence were deported to French Guiana. He annulled the Assemblies and made the Senate omnipotent in constitutional matters. 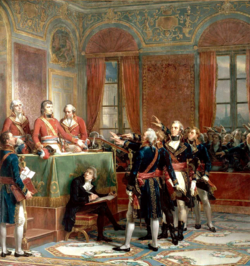 The Treaty of Lunéville, signed in February 1801 with Austria (which had been disarmed by Moreau’s victory at Hohenlinden), restored peace to Europe, gave nearly the whole of Italy to France, and permitted Bonaparte to eliminate from the Assemblies all the leaders of the opposition in the discussion of the Civil Code. The Concordat of 1801, drawn up not in the Church's interest but in that of his own policy, by giving satisfaction to the religious feeling of the country, allowed him to put down the constitutional democratic Church, to rally round him the consciences of the peasants, and above all to deprive the royalists of their best weapon. The Articles Organiques hid from the eyes of his companions-in-arms and councillors a reaction which, in fact if not in law, restored to a submissive Church, despoiled of her revenues, her position as the religion of the state. The Peace of Amiens (25 March 1802) with the United Kingdom, of which France's allies, Spain and the Batavian Republic, paid all the costs, finally gave the peacemaker a pretext for endowing himself with a Consulate, not for ten years but for life, as a recompense from the nation. The Rubicon was crossed on that day: Bonaparte’s march to empire began with the Constitution of the Year X dated 16 Thermidor or 4 August 1802. As Napoleon increased his power, he borrowed many techniques of the Ancien Régime in his new form of one-man government. Like the old monarchy, he re-introduced plenipotentiaries, an over-centralised, strictly utilitarian administrative and bureaucratic methods, and a policy of subservient pedantic scholasticism towards the nation's universities. He constructed or consolidated the funds necessary for national institutions, local governments, a judiciary system, organs of finance, banking, codes, traditions of conscientious well-disciplined labour force. France enjoyed a high level of peace and order under Napoleon that helped to raise the standard of comfort. Prior to this, Paris had often suffered from hunger and thirst, and lacked fire and light, but under Napoleon, provisions became cheap and abundant, while trade prospered and wages ran high. The pomp and luxury of the nouveaux riches were displayed in the salons of the good Joséphine, the beautiful Madame Tallien, and the "divine" Juliette Récamier. In strengthening the machinery of state, Napoleon created the elite order of the Légion d'honneur (The Legion of Honour), the Concordat, and restored indirect taxes, an act seen as a betrayal of the Revolution. Napoleon was largely able to quell dissent within government by expelling his more vocal critics, such as Benjamin Constant and Madame de Staël. The expedition to San Domingo reduced the republican army to a nullity. Constant war helped demoralise and scatter the military's leaders, who were jealous of their "comrade" Bonaparte. The last major challenge to Napoleon's authority came from Moreau, who was compromised in a royalist plot; he too was sent into exile. Because Napoleon's hold on political power was still tenuous, French Royalists devised a plot that involved kidnapping and assassinating him and inviting Louis Antoine de Bourbon, the Duke of Enghien, to lead a coup d'état that would precede the restoration of the Bourbon monarchy with Louis XVIII on the throne. The British government of William Pitt the Younger had contributed to this Royalist conspiracy by financing one million pounds and providing naval transport (with the ship of Captain John Wesley Wright) to the conspirators Georges Cadoudal and General Charles Pichegru for their return to France from England. Pichegru met Jean Victor Marie Moreau, one of Napoleon's generals and a former protege of Pichegru, on 28 January 1804. The next day, a British secret agent named Courson was arrested and he, under torture, confessed that Pichegru, Moreau and Cadoudal were conspiring to overthrow the Consulate. The French government sought more details of this plot by arresting and torturing Louis Picot, Cadoudal's servant. Joachim Murat ordered the city gates of Paris to be closed from 7 pm to 6 am while Pichegru and Moreau were arrested during the next month. These further arrests revealed that the Royalist conspiracy would eventually involve the active participation of the Duke of Enghien, who was a relatively young Bourbon prince and thus another possible heir to a restored Bourbon monarchy. The Duke, at that time, was living as a French émigré in the future Grand Duchy of Baden, but then still the 1803-1806 Electorate of Baden, but he also kept a rented house in Ettenheim, which was close to the French border. Perhaps at the urging of Talleyrand, Napoleon's foreign minister, and Fouché, Napoleon's minister of police who had warned that "the air is full of daggers", the First Consul came to the political conclusion that the Duke must be dealt with. Two hundred French soldiers surrounded the Duke's home in Baden and arrested him. ^ "From Life Consulship to the hereditary Empire (1802–1804)". Napoleon.org. Retrieved 9 January 2012. ^ * Muel, Léon (1891). Gouvernements, ministères et constitutions de la France depuis cent ans: Précis historique des révolutions, des crises ministérielles et gouvernementales, et des changements de constitutions de la France depuis 1789 jusqu'en 1890 ... Marchal et Billard. p. 61. Retrieved 3 May 2014. "Louis Antoine Henri, duke of Enghien"
This article incorporates text from a publication now in the public domain: Wiriath, Paul (1911). "France § History" . In Chisholm, Hugh. Encyclopædia Britannica. 10 (11th ed.). Cambridge University Press. pp. 859–860. Paul François Jean Nicolas, vicomte de Barras, commonly known as Paul Barras, was a French politician of the French Revolution, and the main executive leader of the Directory regime of 1795–1799. The Directory or Directorate was a five-member committee that governed France from 2 November 1795, when it replaced the Committee of Public Safety, until 9 November 1799, when it was overthrown by Napoleon Bonaparte in the Coup of 18 Brumaire, and replaced by the French Consulate. It gave its name to the final four years of the French Revolution. Georges Cadoudal, sometimes called simply Georges, was a Breton politician, and leader of the Chouannerie during the French Revolution. He was posthumously named a Marshal of France in 1814 by the reinstated Bourbons. Cadoudal means in Breton language "warrior returning from the fight". Jean Victor Marie Moreau was a French general who helped Napoleon Bonaparte to power, but later became a rival and was banished to the United States. Joseph Fouché, 1st Duc d'Otrante, 1st Comte Fouché was a French statesman and Minister of Police under First Consul Bonaparte, who later became Emperor Napoleon. He was particularly known for his ferocity with which he suppressed the Lyon insurrection during the Revolution in 1793 and for being minister of police under the Directory, the Consulate, and the Empire. In English texts, his title is often translated as Duke of Otranto. The Council of Five Hundred, or simply the Five Hundred, was the lower house of the legislature of France under the Constitution of the Year III. It existed during the period commonly known as the Directory (Directoire), from 26 October 1795 until 9 November 1799: roughly the second half of the period generally referred to as the French Revolution. The Constitution of the Year VIII was a national constitution of France, adopted on December 24, 1799, which established the form of government known as the Consulate. The coup of 18 Brumaire had effectively given all power to Napoleon Bonaparte, and in the eyes of some, ended the French Revolution. Joseph Souham was a French general who fought in the French Revolutionary Wars and the Napoleonic Wars. He was born at Lubersac and died at Versailles. After long service in the French Royal Army, he was elected to lead a volunteer battalion in 1792 during the French Revolution. He was promoted to general of division in September 1793 after playing a prominent role in the defense of Dunkirk. In May 1794 with his commander absent, he took temporary command of the Army of the North and defeated the Coalition army at Tourcoing. He led the covering forces at the Siege of Ypres and participated in the successful invasion of the Dutch Republic. He spent many years in occupation duties in Holland and then his career suffered because of his association with Pichegru and Moreau. Starting in 1809 he was employed in Spain during the Peninsular War, winning the Battle of Vich where he was wounded. In army command again, he forced Wellington's army to retreat at Tordesillas in 1812. The following year he led a division at Lützen and a corps at Leipzig. He remained loyal to the Bourbons during the Hundred Days. Pierre Roger Ducos, better known as Roger Ducos, was a French political figure during the Revolution and First Empire, a member of the National Convention, and of the Directory. The Plot of the rue Saint-Nicaise, also known as the Machine infernale plot, was an assassination attempt on the life of the First Consul of France, Napoleon Bonaparte, in Paris on 24 December 1800. It followed the conspiration des poignards of 10 October 1800, and was one of many Royalist and Catholic plots. Jean-François-Auguste Moulin was a member of the French Directory. He had a long career as a military officer serving France in the Royal Army of King Louis XVI, the Garde Nationale of the French Revolution, and the Grande Armée of Napoleon Bonaparte. Amédée Willot, Count of Gramprez, held several military commands during the French Revolutionary Wars but his association with Jean-Charles Pichegru led to his exile from France in 1797. He joined the French Royal Army as a volunteer in 1771 and was a captain by 1787. He was elected commander of a volunteer battalion in 1792 and served in the War of the Pyrenees. Shortly after being promoted commander of a light infantry regiment Willot was appointed general of brigade in June 1793. A few months later he was denounced as a Royalist and jailed. In the light of later events, this may have been an accurate assessment of Willot's sentiments. After release from prison in January 1795, he led troops in Spain during the summer campaign. He was promoted to general of division in July 1795. The Pichegru Conspiracy, otherwise known as the Cadoudal Affair was a conspiracy involving royalists Jean-Charles Pichegru and Georges Cadoudal who wished to overthrow Napoleon Bonaparte's military regime. They were apprehended and sentenced to death, but not before the rumors of their plot reached Napoleon. Bonaparte believed Louis Antoine, Duke of Enghien was in contact with the conspirators and his fear of the loss of his power prompted the execution of the innocent Duke. The affair provoked the old aristocracy to oppose the regime as well as strengthening the influence of the Minister of Police, Joseph Fouché.